Castro said Cubans “will forever defend its socialist revolution” and remain unified in their defense of Venezuela and Nicaragua. “For us, as for Venezuela and Nicaragua, it is obvious that the siege is narrowing, and our people must be alert and prepared to respond to every challenge with unity, firmness, optimism and unshakable faith in victory,” said Castro. 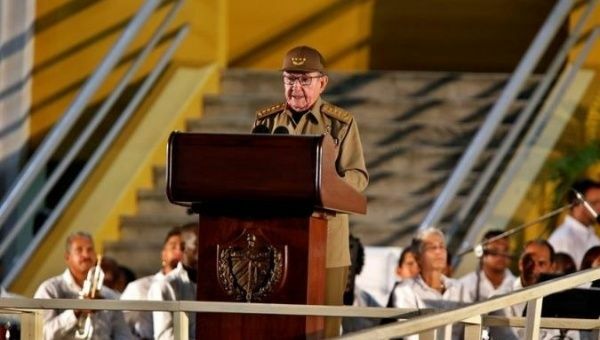 Dressed in his army general uniform, Castro was speaking to a crowd on the occasion of the 65th anniversary of the assault on the Moncada barracks, the start of the Cuban Revolution. He stressed that since August 2017, “bilateral ties have been degraded” between the Caribbean island and the United States with the “pretext” of the so-called “sonic war” against U.S. diplomats in Havana. However, he pointed out that nobody has been “able to explain or prove” that such attacks even took place. Likewise, Castro said the U.S. blockade against Cuba has been “intensified, particularly the persecution of our financial transactions.” Washington’s official pronouncements on the island “are characterized by disrespect, aggression, interference and gross manipulation of historical truth,” Castro said. He expressed “the invariable solidarity of our people, party, and government” with Venezuela and Nicaragua during these difficult times. Castro also said that Cuba is demanding “the freedom of comrade (Luiz Inacio) Lula da Silva and his right to be the presidential candidate of the Workers’ Party,” in October and congratulated the President-elect of Mexico, Andres Manuel Lopez Obrador, “for his historic result” at the polls.